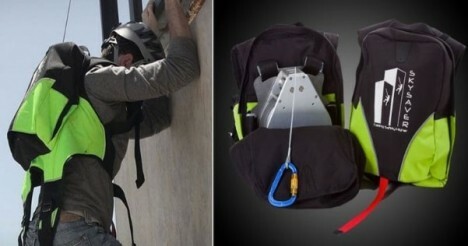 A semi-automatic way to save yourself from a skyscraper disaster, this belaying backpack works automatically to lower you speedily but safely down the side of a structure on fire or otherwise posing live-threatening dangers. The SkySaver hooks onto a pre-installed attachment sunk into your wall, floor or ceiling. 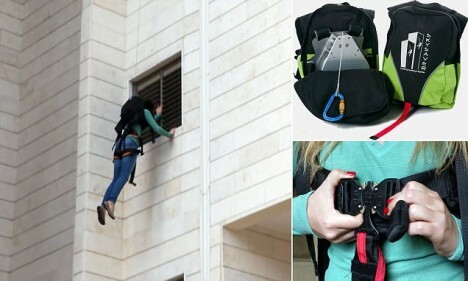 The bag portion clips quickly around your torso, while the line starts letting you down as you exit a window. 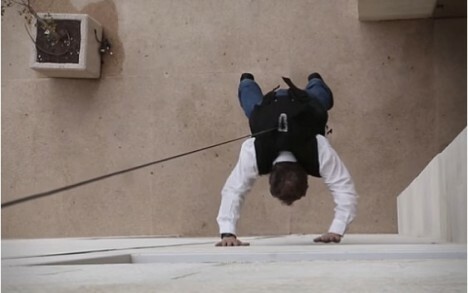 Users have very little to do in the operation of the device – mainly, they just need to push themselves away from the building and let the unspooling rope do the rest of the work, pacing their way down the side. All seriousness aside, this seems like a fantastic way to amuse oneself either recreationally or as a last-day-of work exist from a building to which you never plan to return. See more in Various Gizmos or under Gadgets. December, 2016.